When opened in 1930, the Merchandise Mart or the Merch Mart, located in the Near North Side, Chicago, Illinois, was the largest building in the world with 4,000,000 square feet (372,000 m2) of floor space.Previously owned by the Marshall Field family, the Mart centralized Chicago's wholesale goods business by consolidating vendors and trade under a single roof. Massive in its construction, and serving as a monument to early 20th century merchandising and architecture, the art deco landmark anchors the daytime skyline at the junction of the Chicago River branches. With upper levels bathed in colored floodlight, the structure stands out against darker downtown buildings in night views. The building continues to be a leadingretailing and wholesale destination, hosting 20,000 visitors and tenants per day. 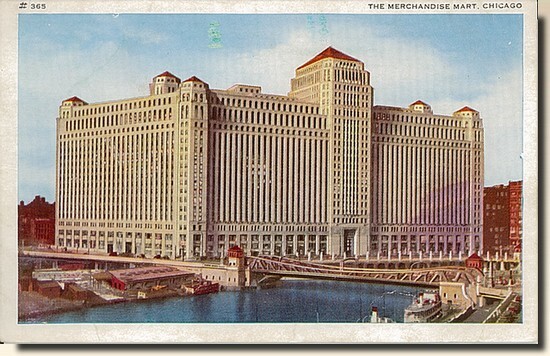 The Merchandise Mart is so large that it had its own ZIP code until 2008 (60654). In 2010, the building opened up its Design Center showrooms to the public for the first time.